God's Soap is a gripping and transfixing noir story, written with an appealingly sardonic voice and an acute observation of a city and it’s inhabitants. During his convalescence in a prison’s nursery, Fede Cortés, ex-alcoholic and denizen of a dormitory town in the outskirts of Barcelona, traces the course of events that have led him to his current imprisonment. He is being charged with a multiple murder case. There is no evidence to be found, and his old age and feeble constitution would make him an unlikely serial-killer suspect, if it weren’t for his plead of guilt, given under bizarre circumstances. A dazzling story comes out of Fede’s witty and pithy voice, reaching back to his early years of poverty and solitude, his change of fortune, and his darkly humorous life as a retired corner-pub dweller run amok. 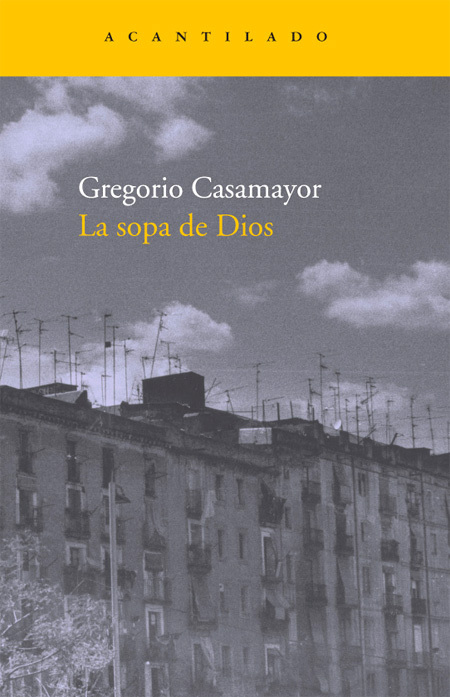 La sopa de Dios shows that luck and misfortune are often intermingled, and happiness and suffering seem allotted by a blind cosmic balance: "If I am happy, my neighbour is bound to suffer an excruciating toothache. This is how life works”.